One thing I've discovered through packing, moving, and unpacking, is that I have too many jars for my limited storage space in the new place. I had been saving jars, thinking I might use them for something, but that's a mode of thought I can't afford now, in a studio with limited storage space. So away they go! The water bottle I'm also getting rid of crept into this picture. It's a nice water bottle but the mouth is too small and I want a top I can drink out of without unscrewing the whole thing. I'll either Freecycle these or drop them off at Goodwill. The water bottle I might offer at a garage sale I'm selling at with my mom this weekend, but I don't think the jars are worth taking. 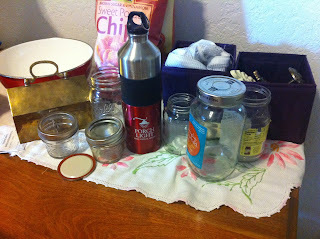 Jars can be useful, and it seems really wasteful to get rid of every jar you empty: spaghetti sauce, pickles, etc. Unfortunately, as I have mentioned before, there is a point where trying to waste less actually makes your life less simple, instead of more so. Although I'm sure at some point I could find a use for these jars, I just don't have the space to store them until that time!